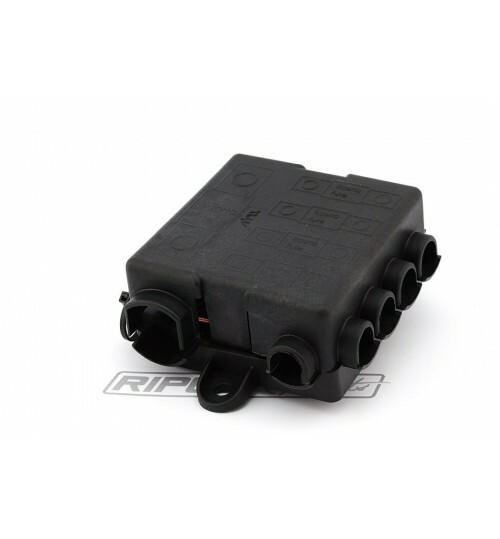 Compact and tough fuse box for distributing power to multiple electrical systems around a vehicle. The main feed in is to a mega fuse location which then feeds a further 4 midi (or strip) fuse locations via 2 copper strips. The box features a tethered, snap-on lid for quick and easy access. The Mega fuse location has 2 cable entry options with a further 6 cable entry options for the 4 midi fuse locations, providing a number of versatile wiring configurations to suit your application. Nuts and locking washers are provided for all fuse locations and the body of the box incorporates 2 feet for mounting to a flat surface. Note: The fuses should be installed underneath the copper strips so that they sit flat and are not distorted when the nuts are tightened down. Fuses not included.